Building upon the success of the 8000A E-Cut™ Hybrid Fairway mower and its popular three-wheel platform, turf professionals will soon have additional fairway mower options with the John Deere 6080A, 6500A and 6700A PrecisionCut™ Fairway Mowers. 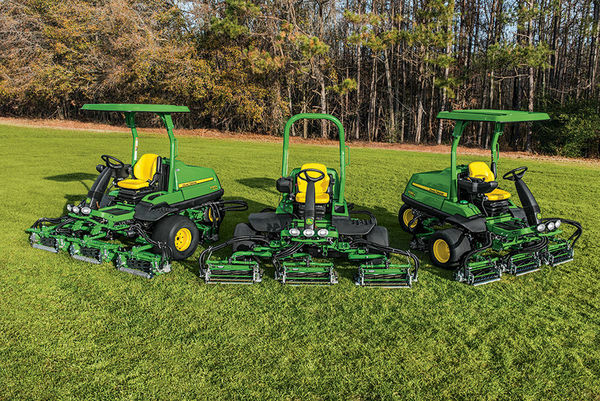 The 6080A, 6500A and 6700A Models leverage all of the fairway mower technologies from the John Deere award-winning A Model family of Fairway, Rough and Trim & Surrounds Mowers. These new A Models were designed out of a customer need for improved budget control while still delivering a fairway mower truly designed for the rigors of fairway applications. "With tight operating budgets and increasing labor costs, our customers needed a cost-effective solution to get the job done," said Brad Aldridge, product manager, John Deere Golf. "With this in mind, we challenged ourselves to design a machine that boosts productivity and maintains quality of cut while keeping costs down, and we've done that with the 6080A, 6500A and 6700A Models." These three new models are true fairway workhorses with a powerful 24.7 HP (18.4 kW) diesel engine, three-wheel smooth tire configurations, and premium performance and comfort features. Additionally, an eight mph (12.9 kph) mowing speed allows operators to mow more area in less time. As with all A Model machines, the 6080A, 6500A and 6700A Models also feature the innovative TechControl Display with password-protected supervisory controls. TechControl allows turf managers or technicians to input a wealth of commands, including mow speed, turn speed, transport speed, and service timers, while also providing on-board service diagnostics – giving them complete control over cut quality and performance. The 6080A, 6500A and 6700A Models also provide several features aimed at increasing machine and operator uptime, including internal hydraulic wet disk brakes that eliminate linkage adjustments and grease points in the brake system, along with a traction drive system requiring only one fluid type for maintenance. Finally, operators will appreciate the comfortable operator station with Command Arm mounted controls that adjust with the seat. The 6080A, 6500A and 6700A Models provide an outstanding quality of cut in undulating terrain thanks to a rear-attaching yoke on the cutting unit. The trusted A Model Fairway Mower platform provides strength and durability. Combined with the standard GRIP all-wheel drive traction system, these additions climb hills easier without the worries of high side tire slippage. The 6080A, 6500A and 6700A Models will each be available in 2019. For more information about the John Deere award-winning A Model family of Fairway, Rough and Trim & Surrounds Mowers, contact your local John Deere Golf distributor or visit www.JohnDeere.com/Golf for the latest news and product information.